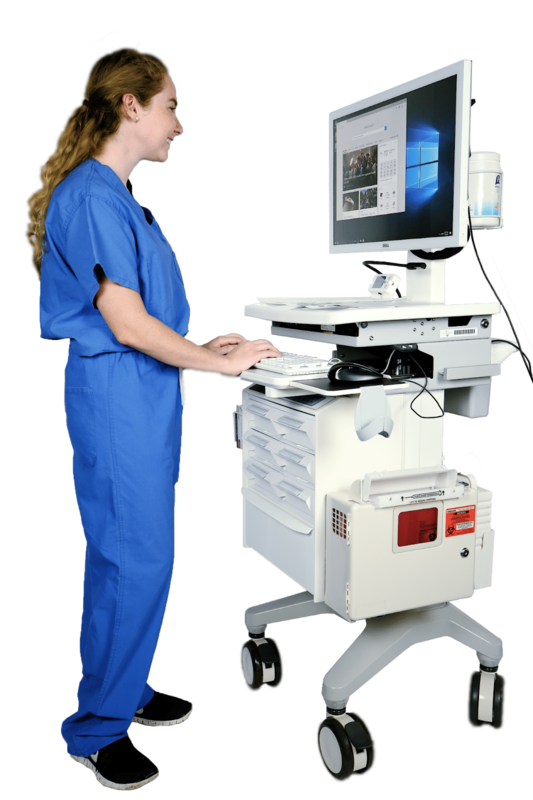 There are many reasons to use a powered mobile workstation cart in your medical facility. The ergonomic design enables flexibility, mobility, and functionality in a compact form factor. Whether you are interested in saving space, improving staff efficiency, or allowing for more quality time to be spent with patients, a powered mobile workstation cart can help you achieve it. 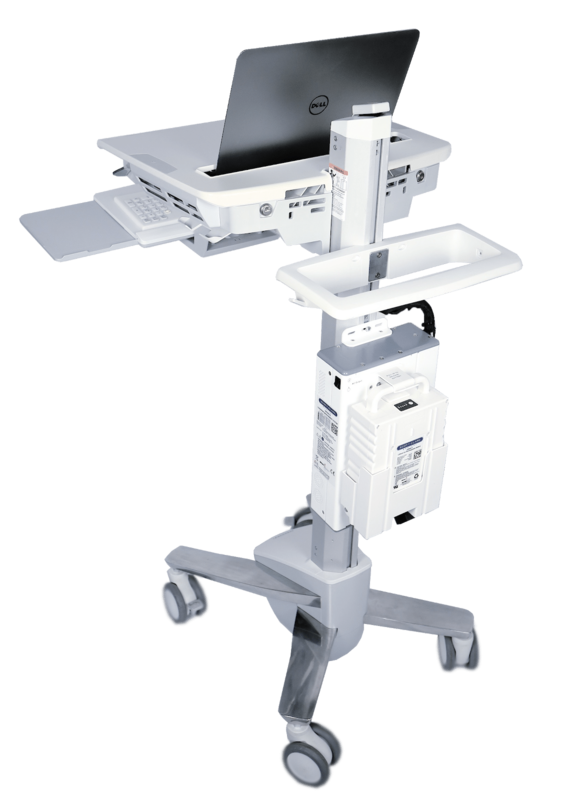 A powered mobile workstation cart is designed to improve workflow so that personnel can spend more time with each patient. You can configure your carts for point-of-care access, data processing, medication dispensing, and more. You can also add other customization options like barcode-documented delivery and vital signs monitoring. With everything they need to hand, staff can spend less time gathering supplies, entering data, or relaying information, and more time administering expert care to their patients. Workstations can be customized to fit the purpose your staff intend to use them for. Features such as the capacity for dual screens, PACS technology, mounting for tablet computers, and space for printing equipment are all available. Other options include quick-lock systems, cassette drawers, sharps disposal units, and barcode readers. Scott-Clark Medical makes its mobile workstations using lightweight aluminum, up to 75% lighter than the other materials commonly used, making them even easier to move around. Our carts are also height-adjustable to suit all builds and fit into any space effortlessly. To meet the needs of your patients, equipment, supplies, and technology need to be on hand without getting in the way. Our carts take up minimal space and can be stored away when not required. Lockable wheels also mean they can become a semi-permanent fixture in your facility. A powered mobile workstation cart can decrease both your capital and operating expenses. By upgrading your existing medical carts or replacing older batteries with longer-lasting FMCP batteries, your mobile workstations will be able to continue serving your facility for many years to come. The life of the batteries included with our mobile workstation carts means your staff won’t have to waste time searching for one with enough power. Each cart uses multiple batteries designed to last for even an extended shift and checking battery status is quick and easy. When they finally run out, a powered mobile workstation cart charges in two-and-a-half hours. FMCP batteries can be quickly exchanged with fresh batteries or charged on the cart. Their extended capacity also means you can use a mobile workstation cart in remote locations for extended periods of time. The most important benefit of a powered mobile workstation cart for your medical facility is that it enables you to take better care of your patients. Our mobile workstations are incredibly portable and easy to customize, use, and maintain, allowing you to spend more time with your patients and increase your productivity. This one tool can provide countless benefits for your medical facility. The ergonomic, functional design of our powered mobile workstation cart systems is intended to make your job easier, so you’re free to focus on making your patients happier and more comfortable during their hospital stay.